I should have written this a week ago but the death of my grandmother was still too fresh for me to bear then. Don't get me wrong; I have gotten over it. I know for a fact that she is in a better place now and that I shouldn't be crying anymore but I can't really say I won't be sad anymore for I know that deep in my heart, I will miss her. But I am not alone in this grieving process. I am not alone in missing her. With me are my family members who loved her dearly especially my mother and her siblings who owe a lot to her. I never really knew my grandfather, Lolo Rudy. He died even before my mother was married to my father. He died while my mother just got her first job. My Lola had to take care of my mother and her other five siblings alone. She raised them all by herself. Knowing my Lola to be a very kind and patient woman, I know for a fact that raising six children is quite a challenge. My Lola's job was a seamstress and she was pretty good at it. My mother often told me of their hardships. Those were indeed tough times for their family but then again, she also told me that despite their very few riches, they were happy. Despite their house being so small and despite them not having a lot, they were contented. My Lola was a very religious woman. She encouraged her children to become religious as well. Not only that, she also went with some missionaries in other places in order to spread the good message of the Lord. She was indeed a servant and a soldier of the Lord. When I was born, my Lola was overjoyed. At that time, my great grandmother was still alive. My Lola's mother, Lilang, was still able to see me before she left this world. Although I cannot remember her face anymore, I know that she was present when I was brought to my Lola's home. Since I was the first apo or first grandchild, my Lola loved me very much. I don't remember how old I was when she wanted to save the ice cream cone that I was eating from falling which ended tragically as my Lola ended up with a broken right wrist. That was devotion. That was how much she loved me and even to this day, I remember that. My Lola always brings me to church every Sunday. She always told me not to worry about the clothes that I will wear because every week, she tries to make me a new dress to wear. As a little girl, I was glad that my Lola was so able of doing such things. Despite my Lola being a great seamstress, she was never really a great cook. She tried her best to cook yummy dishes in the kitchen but she really couldn't make dishes that would make foodies and even famous chefs drool. Just like everybody else, she had shortcomings but we loved her still. When I went to another country to study there and be with my parents, I spent some time away from my Lola. Luckily, as years passed, she was able to visit us there. I remember the funny stories that she had about her first time in the airplane. I also remember the first time she went to the beach with us. She was so excited to get off the boat that she didn't listen to us and just jumped out of the boat while a wave hit the boat. She was wet but happy. My Lola was always adventurous. She climbed the rocky mountain in one of the islands that we went to in Oman. She even wanted to go inside the cave. Luckily, she listened to us when we said we should get down from there. My Lola had a good sense of humor. She loved laughing and smiling. She even liked making people laugh. Despite her age then, I could still rely on her sewing skills. She has visited Oman so many times that I have lost count already. Sometimes she doesn't even want to stay there anymore especially because she says she misses her sewing or pananahi. In her 80's, my Lola changed. We noticed that she has become more senile. There are many things that she forgets especially things that she just found out. The thought worried all of us but that did not make us love her less. In fact, it made us love her more. My mother and her siblings decided that they should all pitch in when it comes to taking care of her. Sometimes she stays over at my parents' home while sometimes in my aunts' homes. It was tough to always see her go to different houses. She kept on complaining about it as she said she just wants to stay in one place. In the end, she settled with my youngest aunts. In the last months before she passed away, I got pregnant. Since I am her first apo, she always asks about me. Whenever she sees me, she always asks me if I am pregnant even when she already knows I am because of my bulging belly. Another dilemma that my relatives had with her was asking her to take a bath. She often says that the doctor told her that she should only take a bath every other day but when we remind her that she hasn't taken a bath in two or three days, she denies it and then laughs. My Lola has also started to become like a child. She enjoyed coloring books and doing things that most young children would enjoy. Yes, she was different. Just a year ago, her sister died. I saw her sister before she passed away and honestly, I think what happened shook my Lola to the core. Although sometimes I think that she doesn't really remember it, I know for a fact that when she does remember the fact that she is gone, she cries. My Lola could have been 86 years old this year. I am sad that she just reached 85 but then again I know I should be happy for God was able to give her to us for so long. She has been a part of our lives for a long time. My regrets would have to be that she was not able to see my unborn child which should have been her first apo from me and Jeff. Jeff told me that he will miss my Lola because of her kindness and her great sense of humor. My husband loved to make her smile and laugh. I also regret that I was not able to say goodbye to her in the hospital in her dying moments. My OB didn't want me to be there especially because I was pregnant. I was in high risk of exposure. Somehow I prayed that she would understand me. My younger sister told me that she regrets the fact that our Lola was not able to see her walk properly and will never be able to attend her 18th birthday. I know we all have regrets but they always come in the end. I have no bad words to say about my Lola. We all loved her very much and we will all miss her. I know that my words will never be enough to describe her. She was an influential woman not just to our family but to those lives she has touched. I have heard so many stories about how my Lola changed the lives of others and for that, I am very proud of her. Lola, wherever you are right now, I hope that you will continue to watch over us for you will be in our hearts forever. Thank you for everything. Thank you for all the wonderful memories that we have had together. Sorry for all my shortcomings. I know I should have been a better apo. I will never forget you. 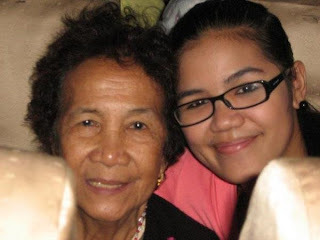 Looking at some old photos of me and my Lola, I found myself going down memory lane. This photo was taken inside a bus last 2008. We were on our way home from a trip outside the city. It was a religious outing if I remember correctly. Too bad we don't have a lot of recent photos together. I could have wished we had some more.